In 1896-97 seven years before the Wright Brothers' first manned flight in a powered aircraft at Kitty Hawk, North Carolina in 1903. 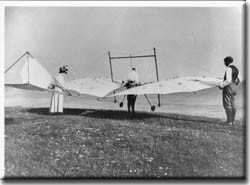 British aviation pioneer Percy Sinclair Pilcher was experimenting with his Gull and Hawk gliders here at Upper Austin Lodge near Eynsford. Originally the site was used as a range for testing automatic and quick firing guns by the Maxim Nordenfeld Guns and Ammunition Co. Ltd. The purpose built hangar that housed Maxim's massive biplane had been relocated to this site in 1894, after the Local Authority insisted on its removal from Baldwyn's Park in Bexley. In the late summer of 1896, using Hiram Maxim's hangar as a base, Pilcher regularly flew his Hawk glider from both sides of the hill known as the 'knob' achieving glides of up to 300 yards, see Map and photos. On June 20th 1897 Pilcher gave his first public demonstration at this site to a large party of Scientists and others. A thin 600-yard fishing line was passed through a fall of tackle on the opposite side of the West valley. Towed by three boys, the man and machine rose to a height of about 70 ft, when the line broke. Pilcher decended gracefully into the valley, having achieved a glide of between 150 and 250 yards. On this same date occurred what is believed to be the first recorded instance of a woman flying in a heavier- than- air aircraft. Dorothy Rose Pilcher, Percy's Cousin, made a short towed glide in the Hawk. She flew down the hill and collided with a gentleman operating a cinematograph camera! Fortunately both camera and operator escaped serious damage. 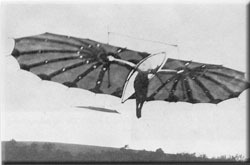 Pilcher later designed and built a triplane fitted with an engine, but his trailblazing work was unfortunately terminated when, during a demonstration at Stanford Hall near Rugby on September 30th 1899, his Hawk glider crashed. Percy was fatally injured, and died on October 2, aged 32. The triplane was never flown. Had Pilcher survived this tragic accident, he might have become the first person to fly a powered aeroplane. Nevertheless, he made a valuable contribution to aviation's early development.